A church micro for St Edward's Church in Windsor. This Roman Catholic church was designed by Charles Alban Buckler and was opened on St Edward's Day, 13 October 1868, in the presence of Archbishop, later Cardinal, Henry Edward Manning. It is personal to us in being the local church in which our family has attended services, christenings, first communions and confirmations. The Parish of St Edward was founded in 1825, and until the present Church was built, the parishioners were served by a small Chapel in Herimitage Road. In 1828, still a year before Catholic Emancipation, the Catholic Directory states that there were three services on Sundays and feast days. At this time many regiments came to Windsor who had large numbers of catholic soldiers and their families. In 1826 the 63rd Regiment listed 311 catholic soldiers in its records and in 1827 the 21st Regiment had 622, and of course they brought with them many women and children to Windsor. In 1841, when the 72nd Highlanders were in Windsor the newspaper reported that the Anglican clergy was annoyed by the fact that some 500 Highlanders are going to “That place in William Street”, [this was the Presbyterian Chapel] and that was not the worst of it, “the remainder of the regiment was going to the Catholic Chapel at Clewer Green”. The first attempts to initiate a new church building were met with opposition, but a larger church was needed, and in 1866 Ramon Cabrera, Conde de Morella, who had started his career as a Spanish brigand and bandit, came to the rescue. He had married an English heiress, and lived in Wentworth. He donated both the land in Alma Road and £1,000 towards the building cost. Major John Riley sold the Chapel House at Clewer Green and used the money to build the Lady Chapel. 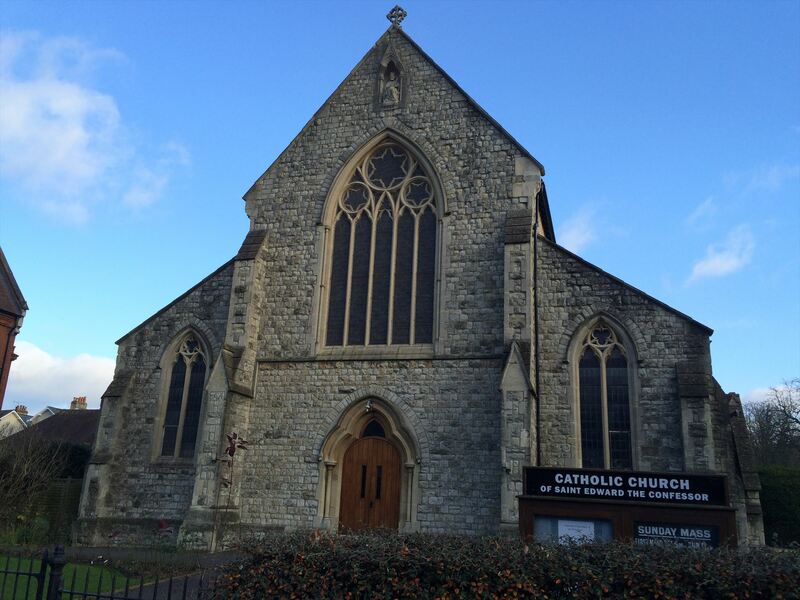 The new church was to be dedicated to St Edward, to show that Catholics in Windsor wanted to honour both a saint and an English king. The name of St Edward the Confessor has long been associated with Windsor. He was favourite Saint of both Kings Henry II and Henry III, and soon after his canonisation, a Chapel dedicated to him was built within the walls of Windsor Castle (now known as the Albert Memorial Chapel). The building is constructed of Kentish ragstone in the Early English style with chancel, nave, aisles and chantry. The chapel features pictures by Murillo and Carlo Dolci, a reredos and a 14th century statue of the Virgin Mary. The windows are all stained glass and include depictions of the rising of Lazarus, the Feeding of the Five Thousand, the Birth of Our Lord, The Presentation in the Temple, the Flight into Egypt and the Holy Family at work in Joseph's carpenter's shop. There is a painting on the left hand side wall that portrays the Marriage of Mary and Joseph, and is unique, in that it is one of the few images where Joseph is depicted wearing a wedding ring. There are very few known pictures of this marriage. On the right wall, the painting portrays the death of St Joseph, with Jesus and Mary attending him. The Sacred Heart Altar, on the left of the Main Sanctuary, was added as part of the 1910 refurbishment. The Central High Altar is the original Altar of the Church. It was moved to its present position in 1910. There is a small writing table in the Lady Chapel which has an interesting story. During the 1970's, when Windsor Methodist Church was being refurbished, the Methodist Community were allowed to use the Lady Chapel for their services. When the work was completed, the Methodist Church was reopened by our current Queen Elizabeth II, and she sat at the writing Table to sign the visitor's book. In thanks for being allowed to use the Lady Chapel, The Methodist Community presented the Table to St Edward's Church. The Writing Table is now used for all Weddings at St Edward's when the Bride and Groom sign the Register. In 2005, St Edward's Church was voted "Windsor's Favourite Listed Building". The cache is a bison tube and contains only a log. Congratulations to kerasoula & The Lords of London for the FTF!